Pope Francis on Friday urged Christians to have the courage to announce the good news about Jesus, just like the Apostles who testified to Christ’s resurrection even at the cost of their lives. The Pope’s words came during his morning Mass at the Santa Marta residence where he said announcing the gospel, intercession and hope are the three interlinked dimensions of a Christian life. Friday (April 22nd) marked the 43rd anniversary of the religious profession of Jorge Mario Bergoglio. In his homily Pope Francis reflected on the three lynchpins that he said should mark the life of a believer: announcing the gospel, intercession and hope. The heart of this announcement for a Christian, he explained, is that Jesus died and rose from the dead for our salvation. This, he continued, is what the Apostles did before the Jews and the pagans and their testimony was made even at the cost of their lives, their own blood. Turning next to the question of intercession, Pope Francis reminded his listeners that just as Jesus told his Apostles at the last Supper, He is praying for us and preparing us a place in the house of the Lord. 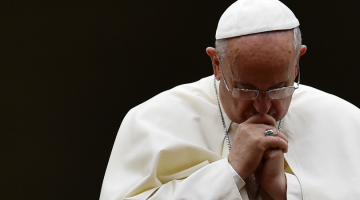 The Pope went on to explain how Jesus intercedes for us by showing his wounds to the Father after the Resurrection and names each one of us to Him. This, he said, is Jesus’ prayer and his intercession on our behalf. “Each one of us, let’s ask ourselves: How is the announcement (of Jesus) in my life? How is my relationship with Jesus who intercedes for me? And how is my hope? Do I truly believe that the Lord is risen? Do I believe that he prays to the Father on my behalf? Each time that I call him, He is praying for me, He is interceding. Do I truly believe that He will return, that He will come? It would do us good to ask ourselves these (questions) about our faith: Do I believe in the announcement of Jesus’ good news? Do I believe in his intercession? 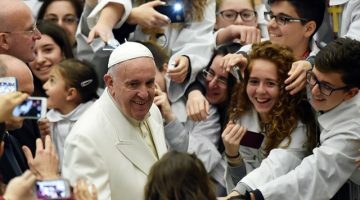 Am I a man or a woman of hope?” (Vatican Radio) Pope Francis on Friday urged Christians to have the courage to announce the good news about Jesus, just like the Apostles who testified to Christ’s resurrection even at the cost of their lives. The Pope’s words came during his morning Mass at the Santa Marta residence where he said announcing the gospel, intercession and hope are the three interlinked dimensions of a Christian life. Friday’s date marked the 43rd anniversary of the religious profession of Jorge Mario Bergoglio. In his homily Pope Francis reflected on the three interlinked elements that he said should mark the life of a believer: announcing the gospel, intercession and hope. The heart of this announcement for a Christian, he explained, is that Jesus died and rose from the dead for our salvation. This, he continued, is what the Apostles did before the Jews and the pagans and their testimony came even at the cost of their lives, their own blood.